Welcome to the site manager! En accédant aux pages d’administration du site vous trouverez les rubriques suivantes (les pages d’administration ne contiennent pas de données éditables). Welcome to the site manager (bienvenue) ! Cette page administrative s'adresse à vous. Mais n'oubliez pas : de grands pouvoirs impliquent de grandes responsabilités. Invitez vos amis ou des collaborateurs ! Il est extrêmement facile d’inviter d’autres personnes à rejoindre votre site en tant que membres, envoyez-leur juste un courriel avec une invitation personnelle. Help & Documentation si vous voulez en apprendre plus ou avez besoin d'aide. Wikidot.com Community Site accédez au Forum de la communauté ! Decouvrez comme il est simple de gagner de l'argent avec vos wikis en utilisant la plateforme publicitaire. Each Wiki Site obtains a web address in a dedicated wikidot.com subdomain. It is however possible to use an external domain for this Site. If you enable this feature this Site will be available via both domains, i.e. handbook.wikidot.com and the new domain. You can also set up to 3 "301 redirects" which means that if these domain are handled by the Wikidot.com servers your visitors will be redirected to the main domain for the Site. This is usefull e.g. to handle domains without the "www." prefix. Warning: it is a cool feature and totally free! 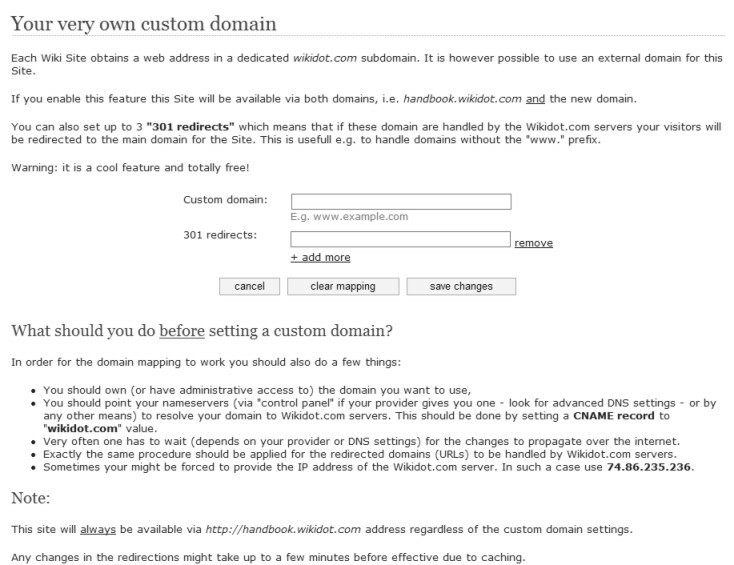 What should you do before setting a custom domain? You should point your nameservers (via "control panel" if your provider gives you one - look for advanced DNS settings - or by any other means) to resolve your domain to Wikidot.com servers. This should be done by setting a CNAME record to "wikidot.com" value. Very often one has to wait (depends on your provider or DNS settings) for the changes to propagate over the internet. Exactly the same procedure should be applied for the redirected domains (URLs) to be handled by Wikidot.com servers. Sometimes your might be forced to provide the IP address of the Wikidot.com server. In such a case use 74.86.234.149. 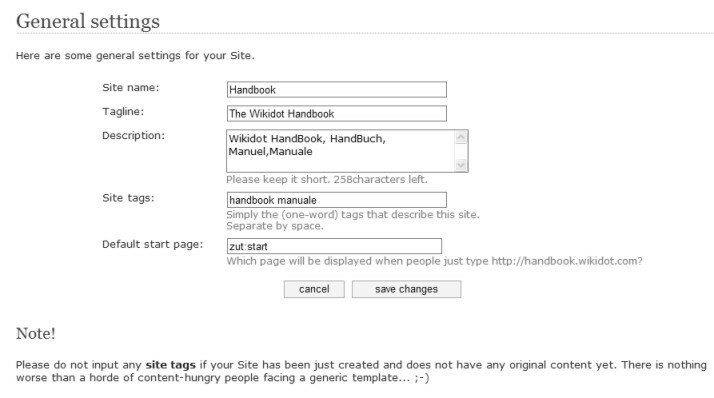 This site will always be available via http://handbook.wikidot.com address regardless of the custom domain settings. Any changes in the redirections might take up to a few minutes before effective due to caching. Configure secure access via HTTPS:// connection. If you care about privacy and security - you should. The secure mode (SSL/TSL via HTTPS) basicly mean that the whole connection between your web browser and your Wiki Site is encrypted. No chance someone could intercept your transmission. This is very useful for private (non-public) sites. This feature is for testing mainly. Although it is free now it is intended to be a premium feature with a monthly fee. However we are giving it away for free now. tags) may sometimes produce a warning of non-secure elements or partially encrypted content in the page if you are using SSL. This warning can also be triggered when you include other elements (like images, iframes) from non-encrypted sources (urls starting with http:, not https:). NOTE: The current certificate works well only within the wikidot.com domain. If you are using a custom domain for your Wiki (e.g. example.com instead of example.wikidot.com) you browser might produce a warning. In case of troubles - please contact moc.todikiw|troppus#moc.todikiw|troppus. 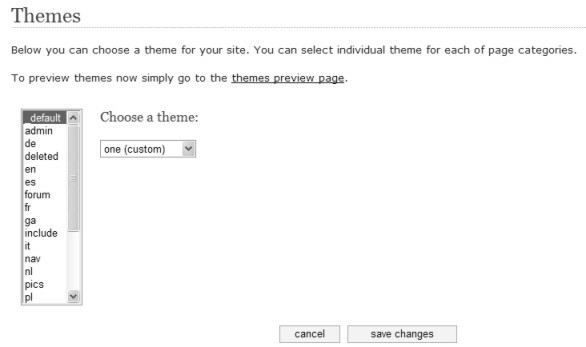 Below you can choose a theme for your site. You can select individual theme for each of page categories. To preview themes now simply go to the themes preview page. Using custom themes you can easily convert your site into a brand new quality. The idea is simple - you can create your own CSS rules. 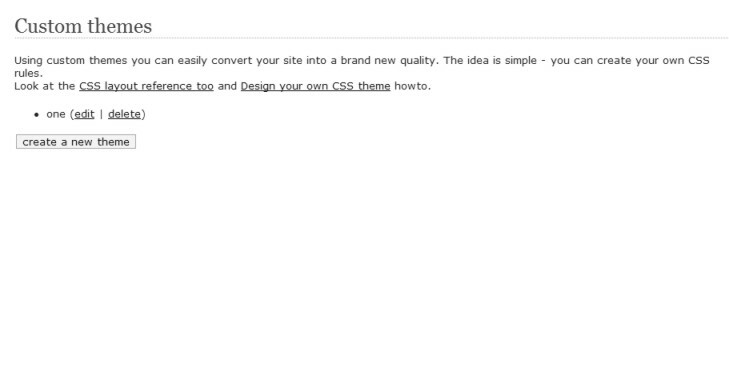 Look at the CSS layout reference too and Design your own CSS theme howto. 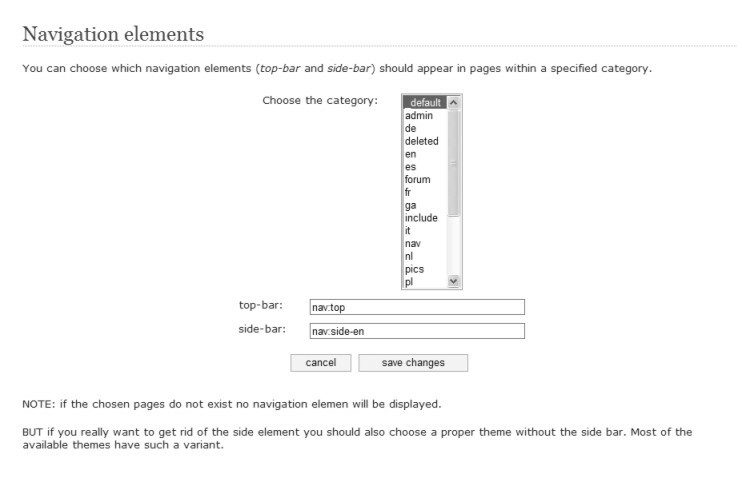 You can choose which navigation elements (top-bar and side-bar) should appear in pages within a specified category. NOTE: if the chosen pages do not exist no navigation elemen will be displayed. BUT if you really want to get rid of the side element you should also choose a proper theme without the side bar. Most of the available themes have such a variant. It is very important to clarify the copyright and ownership issues for your site. We highly recomment setting an open "copyleft" license that allows making the Content more or less free to copy, modify and use. This is particularly important when your Site is created and edited collaboratively. 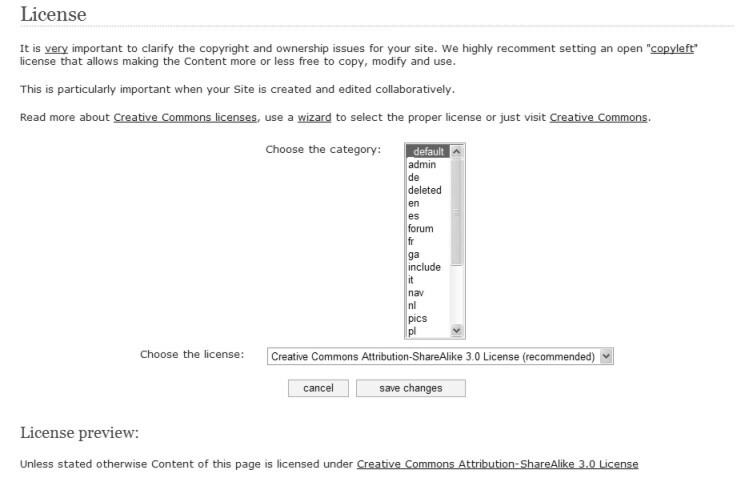 Read more about Creative Commons licenses, use a wizard to select the proper license or just visit Commons. Templates are a convinient way to keep you Site Content well organized and consistent. Below you can assing default page sceletons/templates (pages from the template: category) to new created pages in particular categories. 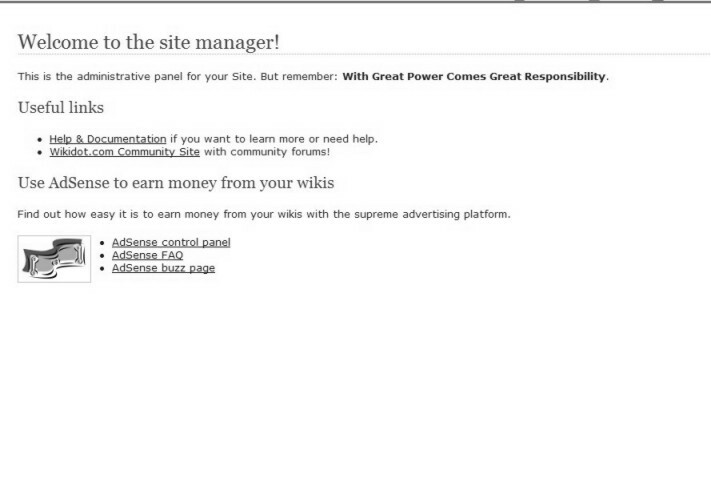 By default all Sites hosted by Wikidot.com are public. If you however choose this Site to be private, only its members + explicitely permitted users will be able to view its contents and display pages. You should also check out Permissions to set who can edit it. If you choose the site to be private it is limited to 50 members + extra 20 users with access permission. Please contact moc.todikiw|troppus#moc.todikiw|troppus to learn more how to increase these limits. The above limits apply only if the site is private. Public sites have no limit on number of users. 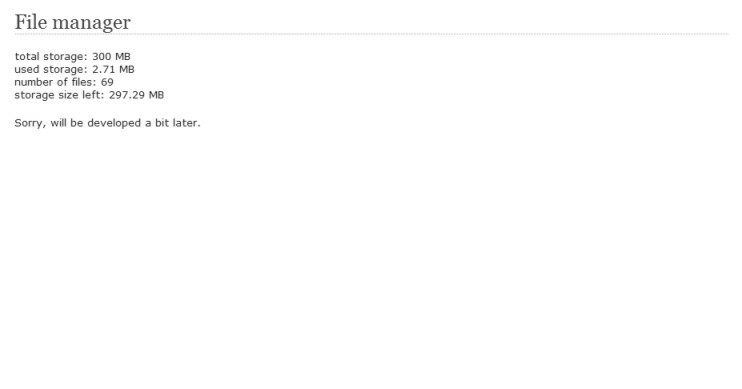 The landing page for unauthorized visitors should at least explain why the site is private and how to get access to it. But this is of course up to you. You can better manage the style and look of the welcome page for unauthorized visitors by creating a welcome page in a different category (e.g. unauthorized:welcome) and disable nav elements for it in the Appearance menu. Prepare your "landing page" so that it accepts either users' applications for membership (module MembershipApply) or enables becoming a member by providing a secret password (module MembershipByPassword). Permissions are one of the most important settings for your Site. You can determine who can edit contents of your pages and alter the structure of the Site. It is up to you to choose who can modify the contents of the Site: anyone, selected people only or just you as the maintainer of the Site. 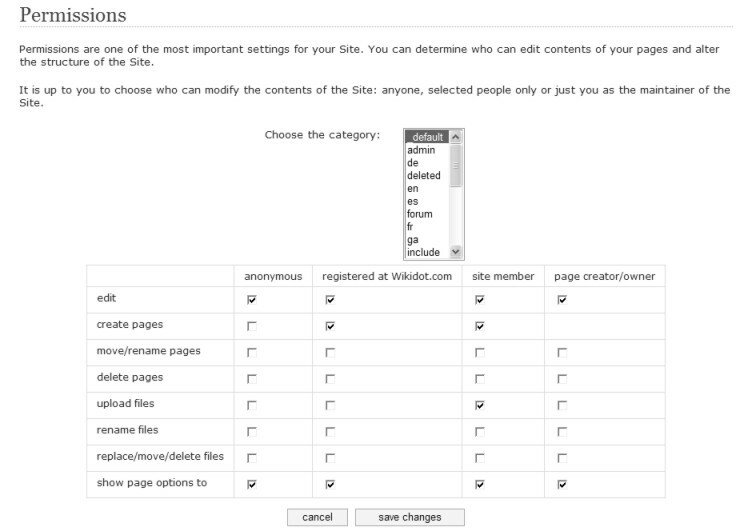 Site administrators and page moderators are not mentioned in the table above because they automatically have all the rights within the site. 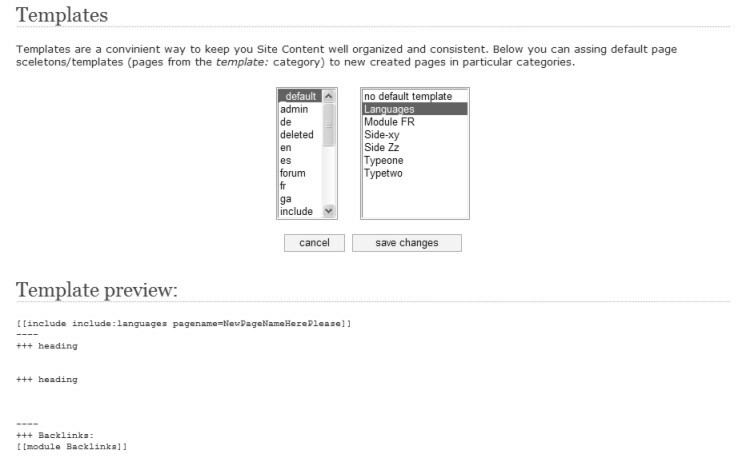 "Page creators/owners" modifier can add extra control and and is suplementary to other options. E.g. it is possible to deny edit permissions in general but allow only to the author that has created the page. Sorry, will be developed a bit later.